We had some unusually heavy rain the middle of last week and that slowed down the fishing a bit. The charters boats that went inshore were averaging a couple roosterfish on a half day trip. The boats that went bottom fishing near the “26” rock picked up some small tuna, small mahi mahi and maybe a wahoo. The boats going offshore were catching a few mahi, some tuna and maybe a sailfish or two. 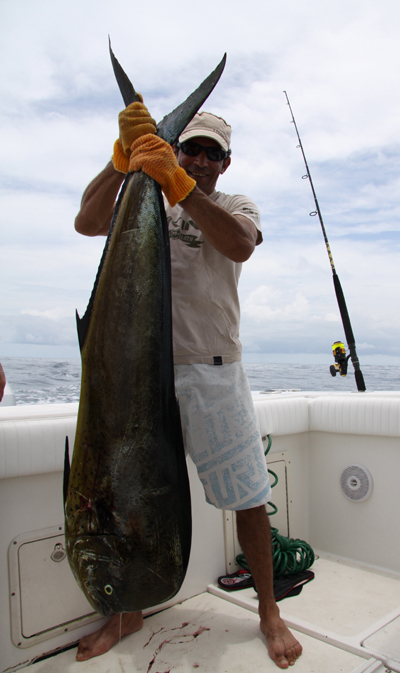 The guys on the 42′ Maverick caught a nice yellowfin tuna in the 150 pound range. Captain RJ took our boat the 26′ Seaswirl out with a couple friends from Cuba and they raised a sailfish and caught a couple mahi mahi including the big fish in the photo above…about 50 pounds. The crew on the 28′ center console went to the “26” rock and caught some yellowfin tuna, a mahi mahi and a couple other fish in the 35 pound range. The captain on the 28′ Carolina Classic took a couple guys for some inshore and offshore fishing. They each caught a nice roosterfish in the 35 to 40 pound range and they also caught a nice mahi mahi, a sailfish and a big triple tail. This entry was posted on Monday, August 24th, 2009 at 2:10 pm and is filed under Uncategorized. You can follow any responses to this entry through the RSS 2.0 feed. You can leave a response, or trackback from your own site.